This week I've really been thinking alot about recycling and repurposing things. I always try to keep and reuse what I can, especially paper and card, so I have drawers and boxes full of all sorts of scraps and wrapping paper. I'd love to say I'll use them all eventually but in reality I probably won't! However, here are some wonderful Etsy sellers who have used old newspapers and books in lots of different ways to create some amazing things. Isn't JustLiv's headband so cute? And I love love LOVE the idea of the paper wreath, like this romantic one from SimpleJoysPaperie. It's so great to see such imaginative repurposing of paper to make beautiful craft items. I'd love to hear your thoughts on how we can make use of the papers many of us have been hoarding... any ideas? Wow, what a lovely grouping of items-- I'm so happy to be among them! Thanks for including me. I love recycled paper & newspaper too. Thank you so much for including my dictionary birds in this fabulous array of items!! 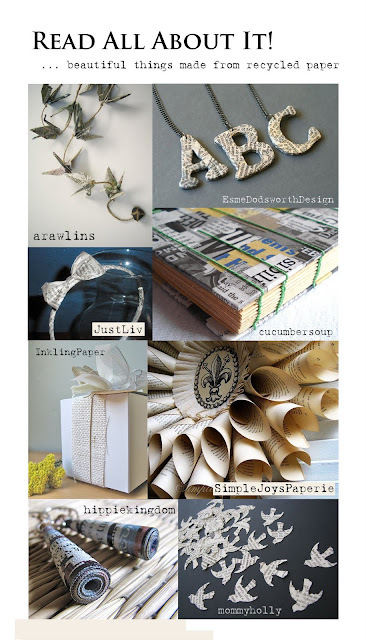 What a gorgeous collection of re-purposed paper, I love it! And your blog is SO cute, by the way!! 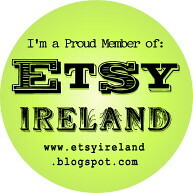 A very cute blog and I am just overwhelmed by the feature! Great picks!! !